Four hundred and ninety-two students were reclassified as English Proficient. 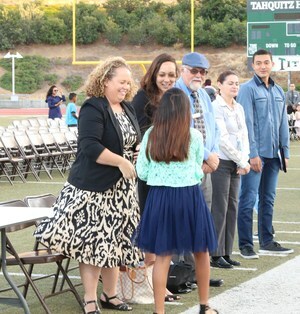 This school year 492 English Learner (EL) students were reclassified as English proficient students. On Thursday, April 26th, an event was held to recognize these students for their dedication and hard work to get to this point. The keynote speakers were Guadalupe Gonzalez and Angel Mejia Zavala, Tahquitz High School students who were former EL students. Both students talked about the journey in becoming English Proficient and the support they received from their families and teachers. The event was full of celebrations as families cheered for the children that were able to reach this difficult goal. Students would smile as they heard their name called over the loudspeaker and walked to receive their ribbon of recognition. In order for a student to be reclassified from EL to English proficient, students must meet certain requirements. They must score proficient on the California English Language Development Test (CELDT) and meet grade point average requirements. Students need a passing test score in Language Arts on their MAP or Lexile test, and their parent must agree their child is ready to advance from the English Language Development program. HUSD offers extensive programs to English Learners so that more students are able to advance in their English language proficiency. Each school site has an English Learner Site Lead to monitor the EL programs at that site. For EL students in elementary, middle, and high school, we are implementing English 3D, a program that targets Long Term English Learners (students that have been in the program five years or more) who need additional support in reaching English proficiency. We also implement Imagine Learning, which is a computer-based program that individualizes instruction and targets the needs of English Learners. Imagine Learning is available to all elementary and middle school students. Students are monitored for four years after their reclassification to English proficient. If a student is struggling with the curriculum, plans are put in place to ensure the continued success of the student. In fact, data shows reclassified students have outperformed English-only peers on state tests. Congratulations to the students who were reclassified as English proficient. 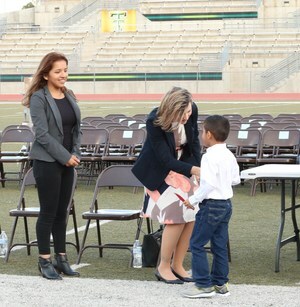 One of Hemet Unified’s main goals in the Local Control Accountability Plan (LCAP) is for EL students to acquire English proficiency in no more than five years. Due to programs that have been implemented through the LCAP, we are confident we will continue to prepare our EL students to become English proficient.